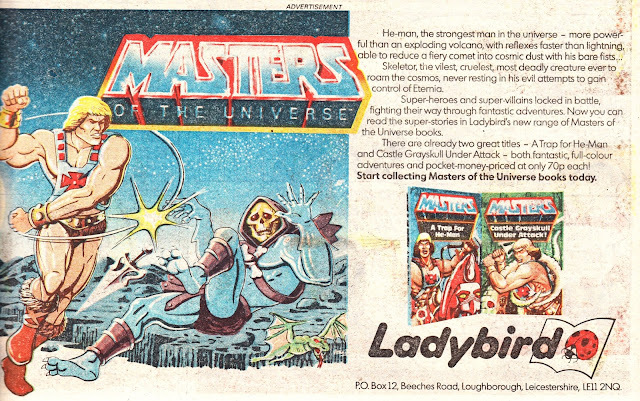 From 21 April 1984: A British advert for Ladybird's MASTERS OF THE UNIVERSE hardback books. I don't think this artwork (although, I must confess, I have not triple-checked) made it into the recent ART OF THE MASTERS OF THE UNIVERSE hardback (highly recommended). Uncredited, of course. The original print quality was not great I'm afraid. RETURN OF THE JEDI WEEKLY also ran a similar ad around issues 100 - 110....this series racked up quite a number of titles... although they didn't appear in the art of book, it would be nice to see them collected. One volume I'm looking forward to is the collected strips from the he-man toys of the 80;s and 90's. Its due in October. These, and other licensed tie-ins, must have been quite a departure for Ladybird after decades of doing their own thing. I don't remember them publishing any books based on media properties prior to the early 1980s. The new MASTERS book is already on my Amazon Wish List (although books like this tend to hit the Direct Market weeks before Amazon get them in stock so I'll get it from whatever source has it first). It will be interesting to see how well the art, created for teeny-tiny inserts, holds up when (I assume) it's reproduced at a larger size. Yeah. I remember those. I think they even did one adapting TRANSFORMERS THE MOVIE (I may even have a copy knocking around somewhere as the Hot Rod-and-the-Matrix cover really sticks in my mind). I never owned any myself but i seem to recall that the Ladybird books were also sold with read-along tapes. I think it was just someone reading the book with a few sound effects thrown in rather than a full cast recording.